Knit in 3 rich colors of Stacy Charles Fine Yarns Adele, the Pomander Walk Capelet is knit in one long piece and features a modular construction. The cast on and bind off edges fit into one another and are sewn together at finishing for a seamless look. 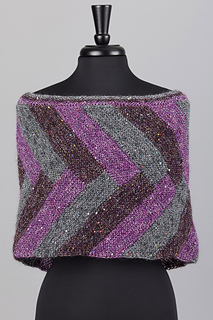 Watch the Knit➔Style➔Wear video for the Pomander Walk Capelet now!